Note: This post originally appeared about 5 years ago. I think it’s pretty good so I moved it back up in the feed. Tearing an ugly hunk out of a nice piece of solid wood can be a heartbreaker. You might be frustrated enough with the experience that you consider giving up woodworking for the game of golf. But before you but your tools on E-Bay and start shopping for knickers and a cool golf cap, see if you can fix it. You may never carve anything, but cases like this are the reason every woodworker should have at least one gouge. Click on the image to see a larger version. Somewhere along the line a big chunk busted out of this piece of quartersawn white oak, intended to be the side of a Gustav Stickley No. 74 Bookrack. Note: Click Here to download a free PDF plan of the bookrack. 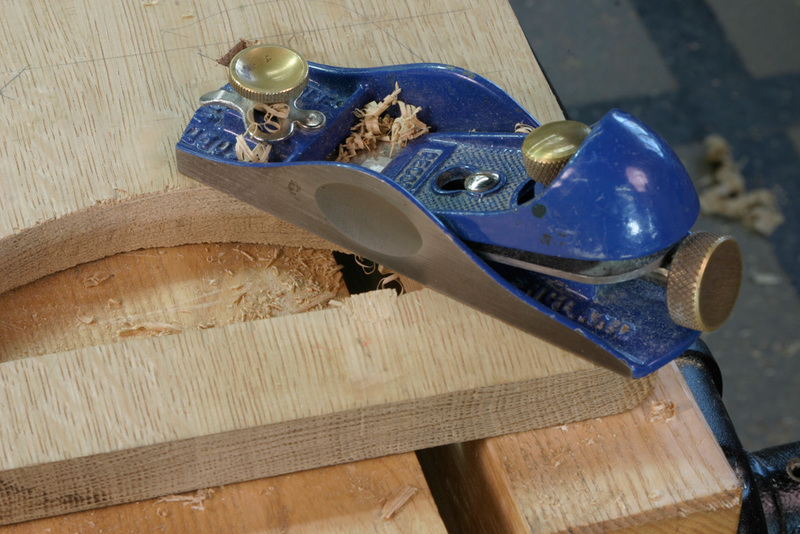 The first thing to do is find a piece of scrap that is as close as possible to the wood you need to repair. The cutout itself would have been ideal, but the tear wasn’t discovered until after that had been tossed. 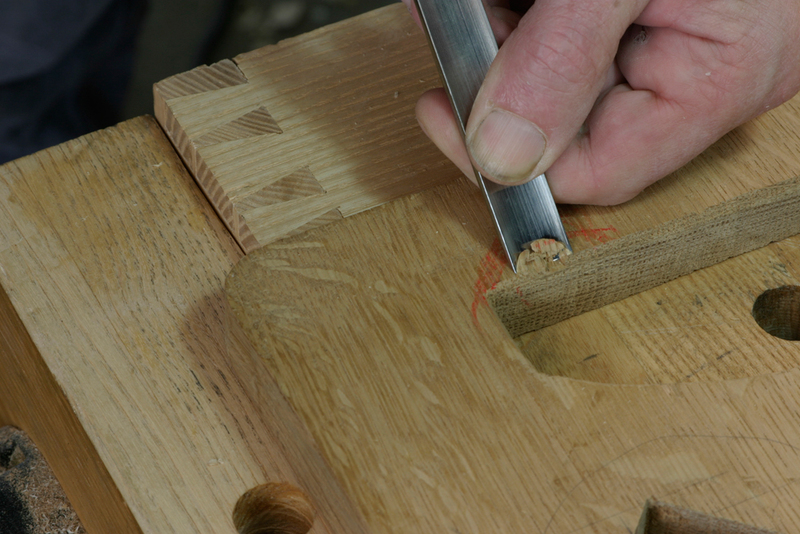 Take your gouge (size and sweep aren’t critical, but the business end of the gouge should be slightly larger than the damaged area) and cut down until you leave a smooth, curved surface. 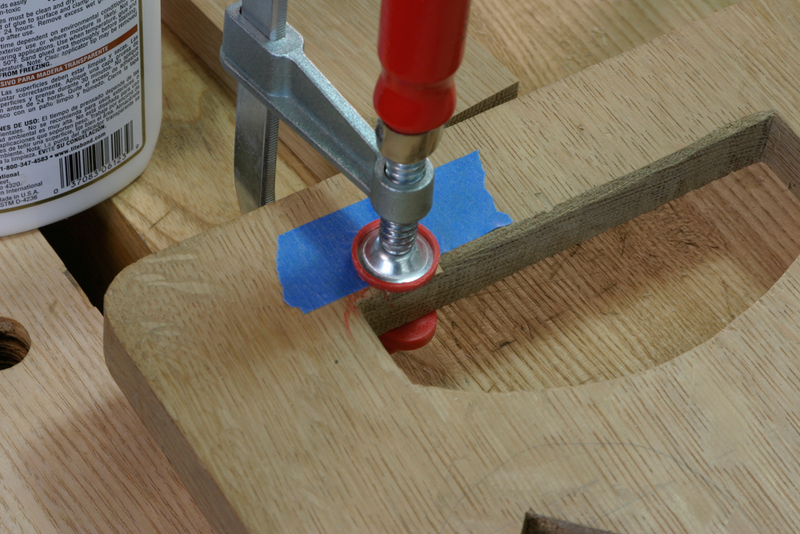 Now use the same gouge to cut out a piece from the end of the piece of scrap. You want to make as deep a cut as you can with one cut. 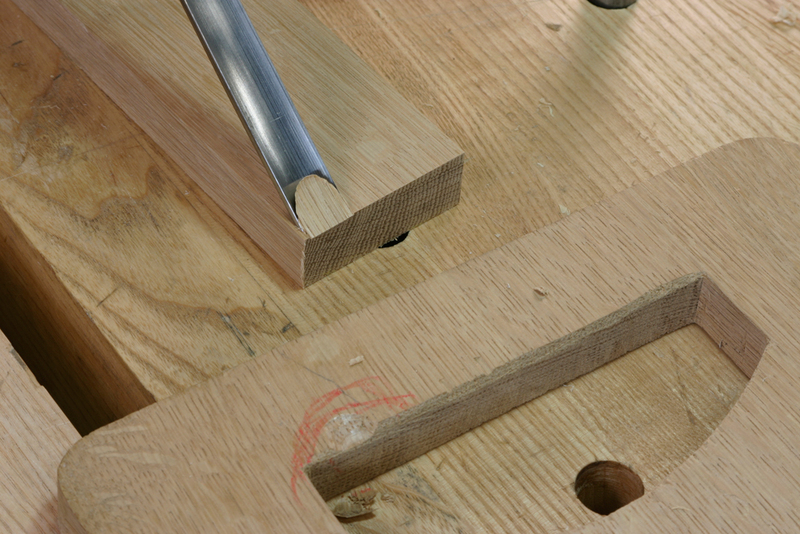 If you don’t have enough leverage to remove the piece by pushing the gouge by hand, smack the end of the gouge with a mallet. If you’re on the very end of the piece, it’s pretty easy to release a big chip with a nice, smooth bottom. 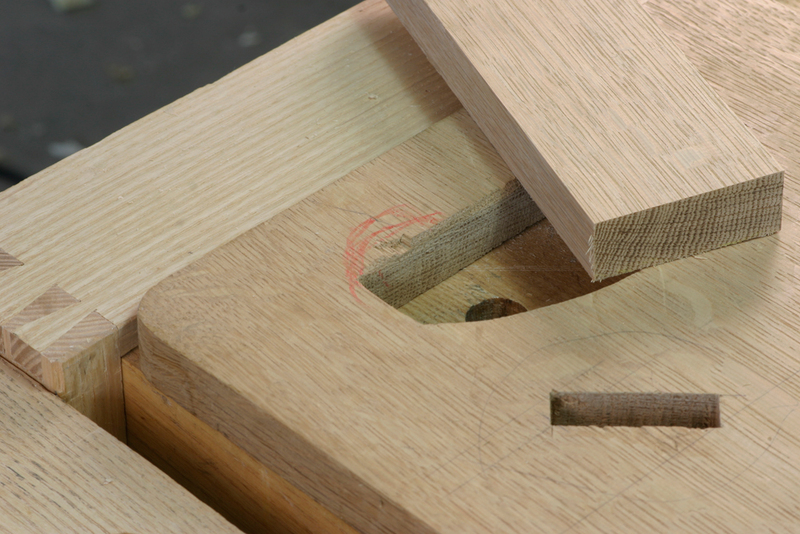 Because you use the same gouge to cut both pieces, you end up with a perfect (or perfect enough) fit between the two. Apply some glue to the patch, put it in position and hold it there with tape. The tape may not apply enough pressure to the patch, so clamp it in place. Go do something else for at least an hour or two while the glue sets. 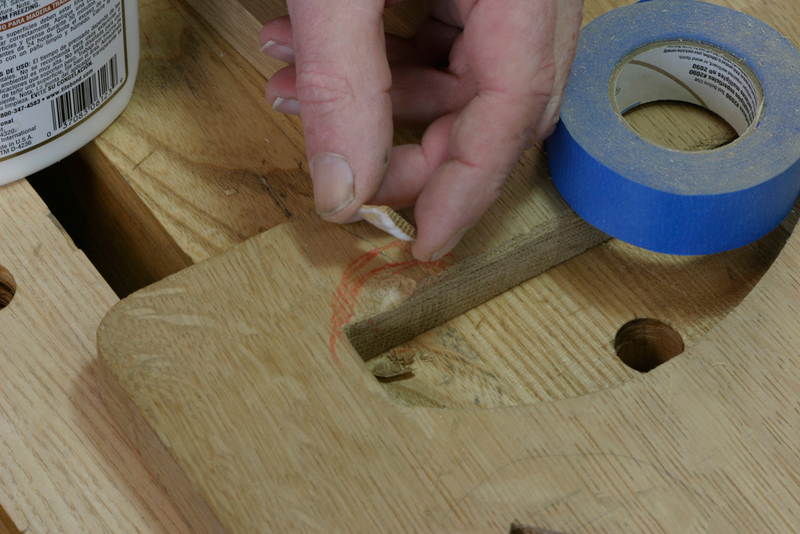 After that, you can smooth out the repair if you’re careful. It takes the glue about 8-12 hours to reach full strength, so it’s better to wait if you can . Plane the surfaces flush, then work on the edges. If the grain and color are close (click on the photo to see a bigger version) no one will ever know that the patch is there. If you’re a typical woodworker however, you won’t be able to resist the urge to point it out, but even then, people will be impressed. With any luck, you’ll have a hard time finding it. You’d have looked silly in the knickers anyway. Great tip, I would have inlayed a triangle shaped patch but your trick is faster and less noticable. I think I would look great in knickers, but i will stick with ww. Yeah Dale, you and I would look good in knickers, but think about everybody else. Very nice repair! Thank you!